There must be many school administrators who have too much time on their hands. They keep trying to come up with new ways to teach and learn forgetting that the best way to do that is to get the brightest teachers you can by paying them a decent salary and then turning them loose in the classrooms. Instead, they have fallen hook, line, and sinker for the electronic toys that have been incorporated into schools at nearly every level. This is part of the common educational practice of bringing the subject matter down to the level of the student rather than to have the student stretch and grow to reach a higher level. Give ’em what they want. The kids play with electronic toys, let’s incorporate them into the curriculum. Somehow. The latest educational fad in “higher” education is to make learning even easier and less painful: let the students stay at home where they can sit in front of a computer screen as passive vessels instead of in a classroom where they might accidentally interact with each other or, worse yet, the instructor. 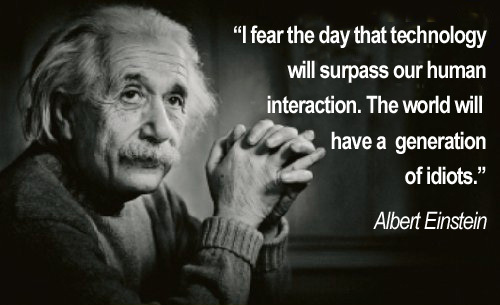 I’m with Albert here: led by a purblind educational bureaucracy we are rapidly turning out idiots who cannot interact with one another and cannot use their minds except to turn things on and off. Socrates was never “certified” to teach, and he didn’t use the latest electronic gadget, either. Plato’s Academy also did rather well without the latest electronic toy, thank you very much. After all, Plato was able to turn out people like Aristotle without a huge cadre of administrators looking over his shoulder, a committee of well-meaning board members to answer to, or a single computer. Our addiction to electronic toys has seriously inhibited human interaction as we see people walking down the street holding electronic devices to their ears or looking down at the device they are sending text messages from: they don’t talk to one another any more, they talk at one another — in broken English. As suggested above, the latest fad in higher education is the trend toward on-line learning, which is simply another way to guarantee that students will learn very little. I dare say it will soon catch on at the high school level as well. Now 30 Under 30 alum 2U, which has previously focused on online graduate degree programs, has decided to throw its hat into the ring. This week, the company, formerly known as 2tor, announced a partnership with a consortium of 10 universities to offer undergraduate courses online. The company’s new program, Semester Online, will launch in September 2013 with a catalog of about 30 courses offered by Brandeis, Duke, Emory, Northwestern, University of North Carolina, Notre Dame, University of Rochester, Vanderbilt, Wake Forest, and Washington University in St. Louis. Whatever the reason, we insist on embracing the latest fashion even when the evidence proves that it not only fails to deliver the goods, but it actually inhibits the results — teaching and learning in this case. Electronic gadgets do not enhance learning; as Jane Healy has shown, they actually inhibit learning. Their use has led to the incapacity of parts of the brain to function as they should, thereby making thought and coherent speech more and more difficult for growing numbers of students. Instead of embracing the latest fad, we might be better advised to simply reflect on the goal of education which is to enable young minds to grow and develop. We need to stop worrying about what is latest, or cheapest and easiest, and start to recall what is most effective: a good teacher in a room interacting with interested and curious students. Preferably they should sit in a circle. A book I highly recommend for all parents and teachers of students at all levels is Jane Healy’s “Endangered Minds.” Healy draws on her many years of experience as a teacher and parent, not to mention the latest in brain research, to explain why our young people have so many problems in school. In a word, the left hemisphere of their brains is seriously impaired by the upbringing that is now prevalent. They watch too much TV and play video games instead of hearing stories and carrying on normal conversations with their elders. The latest assault on language and intelligence is, of course, texting where even the simplest words are butchered. The language they learn is simplistic, she calls it “primitive,” even on shows like “Sesame Street.” What they need is greater facility with more complex vocabulary and syntax, more reading and listening to adult conversation. Having stories read to them and told to them and reading stories themselves, especially at a young age. This is necessary because we think in words and sentences; language is essential for discursive thought and thought is essential for success in school and in the “real” world after school. Many teachers complain that their students have short attention spans (ADD is a growing blight in our culture) and are unable to express themselves except with a few words and many gestures substituting for sentences. They are not stupid, but they are illiterate and as a result the schools have to “dumb down” the curriculum and entertain rather than instruct. It all starts in the home and at an early age. And it needs to be enforced in our schools with more (not less) reading, and a return to teaching grammar and even, perhaps, a foreign language. This is a terrific book, but not for the squeamish. It can be bought at Amazon and, no, I don’t get a commission.